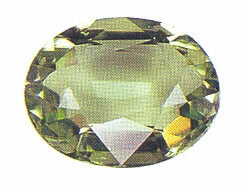 Peridot has an olive or bottle-green color due to the presence of iron, and a distinctive oily or greasy luster. Peridot’s hardness is 6.5 - 7 and it has an orthorhombic crystalline structure. It revitalizes the sense of inner joy and encourages expressing the joy to others. It also provides confident.